For 13 centuries, throughout China male recruits studied diligently for a long series of grueling examinations in hopes of achieving the civil rank that would enable them to serve the emperor of China. For the fortunate few who passed these exams there were nine possible ranks, each identified by a square badge of finely woven kesi, embroidery, or brocade. Now available in paperback, LADDER TO THE CLOUDS offers a thorough analysis of symbols, styles, and techniques used in mandarin square ranks, along with the most complete information for their identification to date. An exploration of Chinese symbols and customs, many of which are still practiced today. Includes vintage photographs and detailed descriptions, photos, and illustrations. Finalist for the 2000 Kiriyama Pacific Rim Book Award. “I love this book! The two different parts of this book really works. 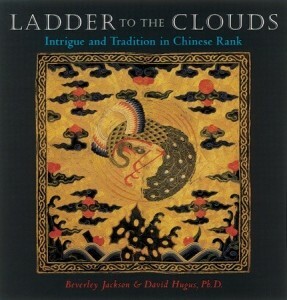 In Part One, written by Beverley Jackson is an interesting look at Chinese culture and the journey to the mandarin squares. The fictional story of two boys and their different journeys brings the mandarin squares to life. The studying and sacrifices involved in order to wear the mandarin square are staggering. It heightens the appreciation of the squares themselves in Part Two. In Part Two, David Hugus does an excellent job in dissecting and then explaining the elements making up the squares. Beyond the intellectual and technical issues, Hugus also discusses mandarin squares in the marketplace.